With the constant influx of content on Twitter, you’ll want to be sure that the list of people you follow is beneficial to your brand. To build relationships with people and brands you need to be connected with two-way conversations and users who are engaged. Before you decide who to unfollow, decide what value each account brings to you. Identify what you want out of each relationship—what value does this user bring? Know the risks of ending a relationship—is a bridge being burned? Determine if the relationship offers a true connection—is this a one-way conversation? 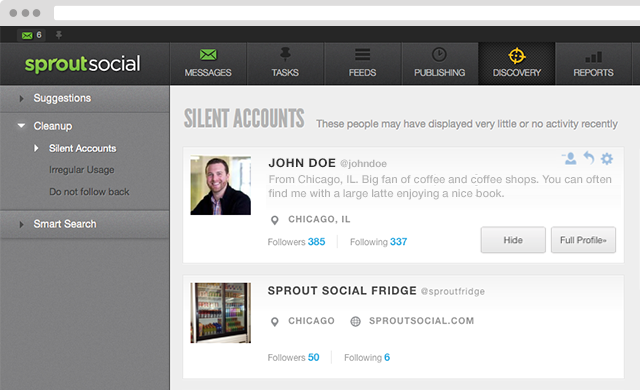 Use Sprout as a tool to assess how vocal your Twitter users have been. From the main navigation bar, choose the Discovery tab, and then go to Cleanup to get a quick snapshot of what users are up to (or not up to). See which users have had little or no activity on Twitter. See which users have unusual patterns of use or abnormal friend counts. Take a look at the users you follow, but who do not follow you. Now That I Know Who These Users Are, Who Should I Unfollow? When deciding who should go and who should stay, don’t make any hasty decisions—let Sprout help! Look a little deeper to get a feel for the user’s activity. Remember, those you haven’t developed strong relationships with are the best to trim first. Look at each user’s past tweets to determine if this connection offers value—do they tweet infrequently, but share valuable content when they do tweet? This connection may be worth keeping. Follow someone who posts often but offers little value? Consider trimming them from your list. From the user card > click Full Profile > look at Tweets. Figure out whether each user is influential. Even if they are infrequent users, their influence in the industry may make the relationship worth keeping. Look at the user card; influential users will have a star by their profile photo. Have you conversed with this user? Look at your engagement with the user to see if there have been an active two-way conversations. From the user card > click Full Profile > look at History. How Do I Unfollow These Users? Once you have determined which users you’d like to trim, return to the Discovery tab, and then go to Cleanup. Find the appropriate user under Silent, Irregular Use, or Do Not Follow Back and hover over the user. the user to remove their profile from the list. This does not hide the user on Twitter or from your Smart Inbox. the user to remove their profile from your Twitter and Smart Inbox. Note that you’ll also see options to view the user’s full profile, send this user a direct mention, or report them as spam. 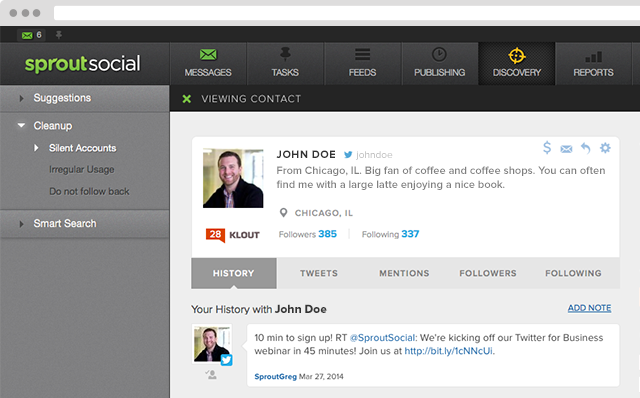 If you haven’t signed up for a free 30-day trial yet, try Sprout Social now.